Thankfully, the world will not be cursed with a Hot Felon action figure. At least not for now. Jeremy Meeks was dubbed the "Hot Felon" when his mugshot went insanely viral in June. Since then, there have been dozens of rumors about his potential projects and possible future career paths. This week, a company called That's My Face posted an article on their website promoting a Jeremy Meeks action figure at a price of $109. When Mashable reached out to That's My Face for more information regarding the action figure, we were told by spokesman John Keaton that they were still "currently in contact with Meeks' agent" — after having advertised the product. Within an hour, Keaton contacted us again to inform us that the doll would no longer be for sale, due to a "threat of legal action" from Meeks' team. 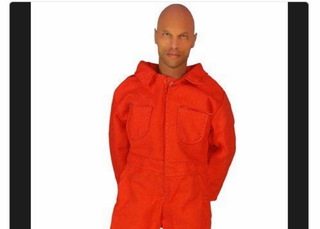 "Unfortunately, a representative from GR Media, who claims to represent Jeremy Meeks, did eventually get back to us and prefers that we do not publicize our one-off custom figure of Jeremy," Keaton said in an email. "He demanded, under threat of legal action, that we remove the photos of the figure, which we have done." A few pictures of the toy surfaced with the figure posed behind bars, holding a gun. According to Mashable, those pictures were removed from That's My Face's website. As NYMag's The Cut points out, this is a case where things have gone too far.